Upon arriving at the Stevenson house, I was greeted by the proud big broth, Sawyer, who was very interested in what types of props I had with me and helped me unpack several of them. We then walked into the living room where he helped me take a few photos and throughly enjoyed seeing the photos he took as well as seeing himself in the photos that we had taken thought out the time I was there. We then moved into the master bedroom where Elyse has just finished feeding Noah and he was the happiest, most content little guy! Seriously, I don’t think I heard him cry the whole time I was there. Josh and Elyse, has a home full of natural light and light neutral wall colors that created the perfect atmosphere for some light and airy photos. They are also some of the most kind, laid back parents I have met for having a one week old and a toddler in the house. Elyse decorated Noah’s nursery with the sweetest little accents and tasteful decorations that did not distract from the photos that were taken. 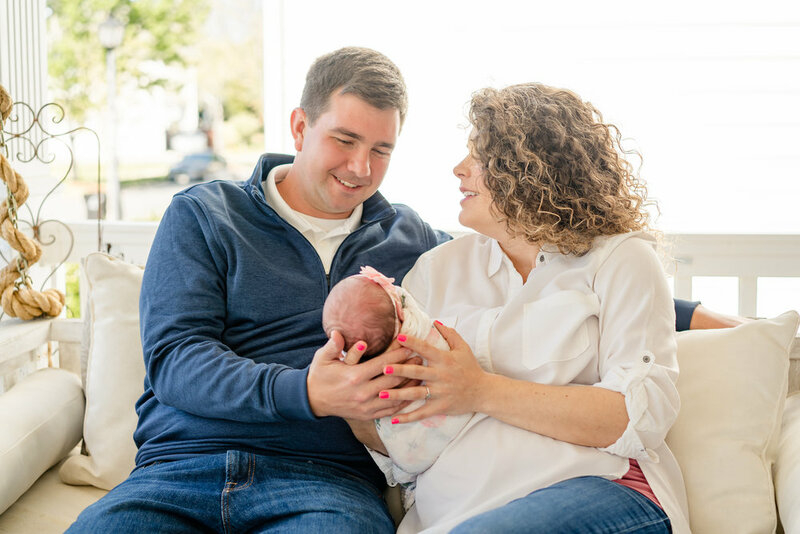 It allowed us to really focus on them and their relationship with their new son in these photos. We finished our sessions by going in the backyard under a shady tree to capture one more family photo. Sawyer was trouper by smiling and got a fun blue sucker at the end of it all!! It was such a pleasure meeting the Stevenson family and it was an honor to be able to the first to document their life as a family of 4! First Birthday's are the BEST! Birthday cake, balloons, gifts that mom can wrap right in front of you and you have no clue, family and friends all coming in to celebrate...... and you have no idea what is going on or why everyone is so excited, but no doubt there will be photos for you too look back on!! Thats what first birthday's are made of! Little miss Kenzie turns one this month and I have had the pleasure of not only taking her first birthday photos but also her newborn photos, four months old and 8 month old old photos. I was also blessed to be able to do the same for her older brother Palmer (isn't that the cutest name ever!!). For this session we went to an open field in Davidson, NC and had the looming threat of thunderstorms just north of us. As always, the Hague's were ready early for their session and when I saw the storm pop up I was happy to hear that they were ready to go so we could start early! We got some great family shoots, some of Kenzie and Palmer and then of Kenzie with a cute little cake her mom picked up from Publix. After Kenzie got a little time with the cake by herself, Palmer got to come over and try some cake too and even try to feed his little sister some icing! In perfect timing, once we got all packed up (or cleaned up in Kenzie's case) I got the first sprinkles on my windshield and had them all the way home. I am so thankful we were able to get this session done and the Hague's will have their little girls photos before her first birthday! I have to say, I am sad I won't be seeing this sweet family every 3-4 months to capture those first year moments but I will be fun to see how much they grow as I hope to continue to photograph their family at least once a year!! They are the sweetest kids, the most beautiful blue eyes and dark long eyelashes and have amazing laid back parents that are such a joy to work with. Thank you Hague Family for trusting me to capture the first years of both Palmer and Kenzie!